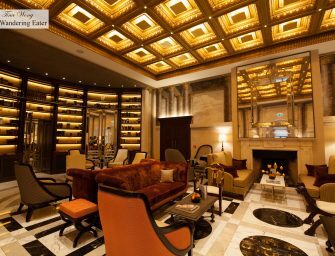 [Translate] The stunningly beautiful Hotel Eden is located above the fray near the top of the Spanish Steps, which gives it breathtaking views over the whole centro storico to St. Peter’s and beyond – especially from the rooftop bar/restaurants. But at the same time, it’s just a 10-minute walk from the buzz, sights and shops of Piazza di Spagna. Even Termini train station is within walking distance – though few of the Eden’s clients would ever dream of arriving or leaving on foot. It was closed for a 17-month renovation, the hotel re-opened in April 2017. The design by French..